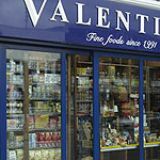 Valentina is an Italian owned restaurant and delicatessen on Notting Hill Gate. The 50 cover restaurant offers a seasonal menu throughout the day using some of their own grown produce and family recipes. The deli stocks an impressive array of regional cheeses, olive oils, antipasti, pasta and much more. Valentina also offers a delivery service to the local community. Seating at the front of the premises. Located on W11's busiest thoroughfare, this cosy, ham-filled deli and dining spot has recently opened to sate the ever-discerning palate of Notting Hill. The dining room, tucked away behind the well-stocked and gloriously-scented delicatessen, is casually decorated with quirky tricolor motorbikes and a duo of sparkly wine-bottle chandeliers. Offering a more casual affair than its Notting Hill compadres, Valentina's pale olive-banquettes and smart wooden trappings make a comfortable setting for a nice, relaxed supper. Despite not being open long, Valentina is busy luring the locals in via the welcoming deli. The efficient, friendly staff have a passion for the Italian menu and are happy to guide you through the seasonal ingredients. The clientèle is a sociable mix of smart, young professionals, Italian food aficionados and the local Notting Hill tribe in for a hearty, unpretentious feast. With ingredients sourced from only the finest Italian suppliers, the winter menu is a awash with decent dishes. Alongside a good pizza selection, there are some real treats including quaglia - quail stuffed with porcini risotto and smoked mozzarella (£6.75). For starters, try the rana pescatrice a delicious pancetta-wrapped monkfish served with cauliflower puree and cherry tomato sauce (£6.95). It's heavenly to taste, yet the rather minuscule portion leaves you a little desperate for more. The frito misto (£7.50) is far more generous and arrives as a pile of lightly-battered fresh squid, tiger prawns and courgettes. As for mains, this is where the belt definitely needs a loosen. The tagliolini al asticee cozze (£16.95), is an immense dish, piled high with a half a lobster, mussels and fresh pasta served in a garlic, white wine and cherry tomato sauce. If it's proper comfort food you're after then the capella romana (£12.75) is an absolute must-have. 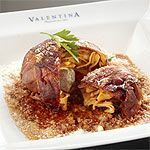 A ham-covered bowling ball arrives filled with fresh tagliatelli, Nonna's home-made meatballs and melting cheese and baked al-forno style. And if that's not enough meat, it's then doused in a gorgeous bolognaise sauce. It's the ultimate belt-buster. If there's room for dessert, the traditional panna cotta (£4.95) is nice enough but comes with an overly sticky raspberry coulis and a shot of good chocolate ice cream. And if you're still not stuffed after that bowling ball of meat, then the budino di panatonne, (£4.95), a heavy Italian bread and butter pudding will certainly finish you off. As you would expect, the wine list at Valentina is extensively Italian and features some good examples from every region. Very drinkable house wines start at around £16, while many others are also available by the glass. If you want to spend a bit more there's an excellent range between £20 and £30 including a nice Barolo Villadoria. The fizz, again is exceptionally good value for Notting Hill, and a nice prosecco will set you back a smidge over £20. For good, home-cooked Italian food and the opportunity to take home a goody bag of fine Italian delicacies, this place is a sound bet.